Darbar Sahib [or Golden Temple], Amritsar. bl.uk > Online Gallery Home	> Online exhibitions	> Asia, Pacific and Africa Collections	> Darbar Sahib [or Golden Temple], Amritsar. 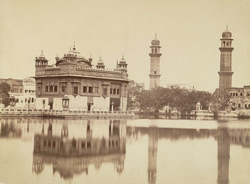 Photograph with a view of the Darbar Sahib complex and sacred reservoir at Amritsar in Punjab, taken by an unknown photographer in the 1880s, part of the Bellew Collection of Architectural Views. The city of Amritsar, largest in the Punjab and holy to the Sikhs, lies between the Beas and Ravi rivers, close to the Pakistan border. It is renowned for the Golden Temple (Harmandir), the holiest shrine in the Sikh religion. Amritsar is a derivative of the Sanskrit amrita sarowar or 'pool of nectar', and the third Sikh Guru, Amar Das (1552-74) came to this area of forested tranquillity around the pool. His successor Guru Ram Das, may have been offered the land as a gift by the Mughal Emperor Akbar, but also paid off the local jat peasantry. In any case, the association of the gurus with the area made it a place of pilgrimage, and the fifth Guru, Arjan (1581-1606), added the Harmandir to the site. The city developed and in the 18th century acquired the name Amritsar. The original simple structure was brick-built in the centre of the pool, with a connecting causeway. With the expansion of Sikh power in the 19th century, the temple evolved into the Darbar Sahib complex, replete with gilding, marble and inlay decoration.